What kind of thinking do you do? Choosing the right coaching program for you is important to your success as a leader. 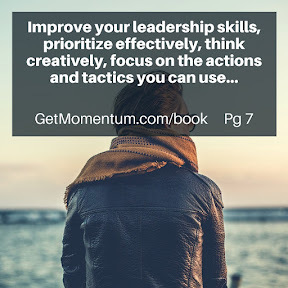 If you’ve been thinking about joining the GET MOMENTUM Leadership Academy, don’t worry about the messes you still have brewing or the stuff that’s not in place. We know there will always be something that’s not 100%! Let us help you over the next 12 months...join today. This month you'll learn how the best leaders think strategically and work tactically. Here is a link to take this month's Self-Assessment. Click the link and take the quiz. 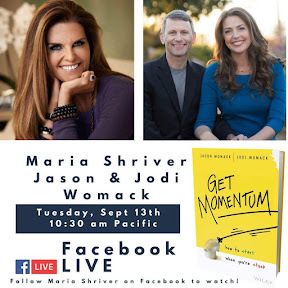 Then, if it's time, let Jodi and I be your coaches as you GET MOMENTUM. You'll join a Leadership Development program that will challenge you mentally and prepare you for the next 1-3-5 years. We've JUST released this month's Master Class (recorded) and Course Work. For the best results, we encourage you to join today. We wish you the BEST in all you do. Before you know it, you're doing the thing that's the next thing to do on your list of responsibilities. You're busy, hurried, seemingly not able to get to some of those Most Important Things, the projects you keep hoping you'll get to. Now is the time to Get Momentum. You know what you want to be doing, but you're not doing what you know you need. 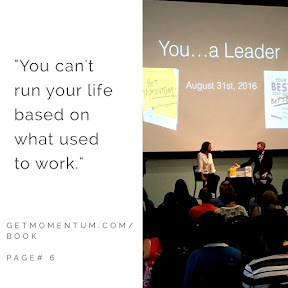 Seeing where you were, and turning your back on what's not working...these are two ways you can get momentum today. If you want things to change, start by changing the way you do things. First: What did I finish today? Second: Who helped me today? Third: What am I grateful for today? When you have those 30 cards, put them away to review a year from now. You'll be amazed at your growth, I promise. 2. Make a Not Doing List NOW! Look at your calendar, review your to-do list, and think of the projects you think you need to do. Next, write a list of at least TEN things you are NOT going to do/think about/work on today (or better, this week!). Give yourself the freedom you need to open yourself up to what could be. You deserve it. If it were easy, you'd already be doing it. If it was just a matter of "doing it," or if you're lying to yourself thinking that you need more "time," then this is for you. "I learned something from this: that one should reconsider perpetually one's reasons for doing something, because it may be that the circumstances have changed." If you're an employee, you're a leader. If you are responsible for a function, some output that your department is "#KnownFor," you ARE a leader. Maybe not in the #military or #political sense. But, every day that you wake up and in-tend to do/be/have something, you're leading. Naturally, the question you're asking, "Who am I leading?" The answer always starts with a single pronoun: "You." You're leading yourself. Through your morning rituals. As you make your way to your workplace. When you switch between tasks (or between distractions). As you make your way through the day, you're setting the direction you want to go in, and then your influencing yourself to take the actions necessary. When you think of leadership, you've got to start with the woman or man in the mirror. As a result of learning this, will the people I'm leading trust me more? Learning to be more followable should be the only thing that leaders study their first of promotion. How are you doing it?